Conferences play an important role in many fields and industries, with topics ranging from the general (World Business Forum) to the strange (Merfest) to the just plain fun (FinCon). They are a great opportunity for professionals, academics or hobbyists to meet others in their field, learn about the latest developments and generally geek out. They are also the perfect excuse to explore a new city. Not all conference destinations are created equal, however. Those who regularly attend conferences may tire of New York, for example, with its high prices and crowded streets. And of course, no one wants to attend a conference at which there is nothing to do once you step out of your hotel. Southwest is best. 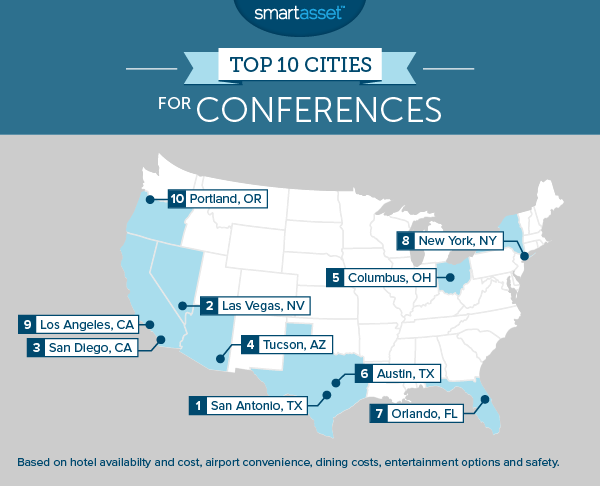 Four of the top five cities for conferences are located in the Southwest, with San Antonio taking the top overall spot. Try Texas. If you’re planning a conference, that is. Along with San Antonio, two other Texas cities landed in the top 15, with Austin placing sixth and Houston claiming the 13th spot. These Texan cities are affordable but still offer conference-goers plenty to do during after hours. 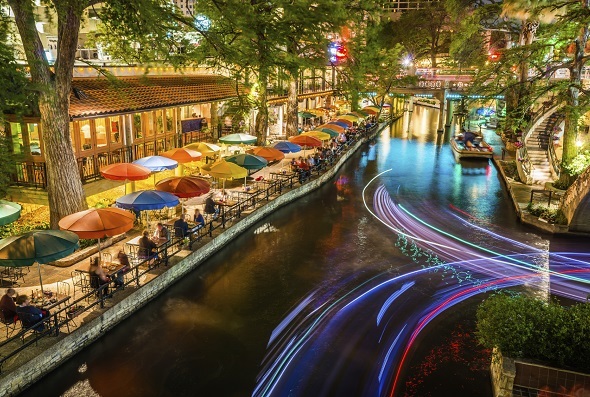 Take a stroll along the Riverwalk, enjoy the country’s finest Tex-Mex cuisine with an ice cold margarita or get a lay of the land from the top of the Tower of the Americas. These are among the many ways to pass the time in San Antonio when you aren’t attending a panel discussion or a workshop. For conference organizers, capacity is key and in that regard San Antonio measures up. The city has the eighth highest number of hotels of any major U.S. city, including large hotels (250 employees or more) such as the Grand Hyatt San Antonio. The Henry B. Gonzalez Convention Center is located directly along the Riverwalk, and has over 200,000 square feet of meeting space, along with four exhibit halls. And what about cost? San Antonio is far more affordable than other popular convention destinations such as New York City or San Diego. According to the cost of living data aggregator Numbeo, the average price of a three-course meal in San Antonio is just $17.50, less than half the price in NYC. Likewise, the average rate for a hotel room is $131, below the average for major U.S. cities. When it comes to conferences, Las Vegas is a safe bet. Sin City has a multitude of giant hotels and not all rooms are as expensive as the Penthouse at the Bellagio. Indeed, according to Hotels.com, the average price of a hotel room in Vegas is just $119 per night. Another advantage of attending a conference in the Nevada desert: the airport is just four miles from the city center. Better yet, the Las Vegas monorail runs straight from the airport to the convention center, which means you won’t have to wait in traffic upon arrival. Beaches? Check. Sunshine? Check. World’s best burritos? Check. There are plenty of obvious reasons to visit San Diego – and just as many to hold a conference there. For starters, the city has ample infrastructure for conferences, with many large hotels. This tied with Las Vegas for the sixth highest amount of hotels of any U.S. city. Find out now: What is the cost of living in San Diego? The city also has an incredibly convenient airport, located just a few miles from downtown San Diego along the San Diego Bay (though there is no rail connection, so be prepared for 10 or 15 minutes of San Diego’s notorious traffic). These and other factors have made San Diego the annual host of one of the largest and most popular conferences in the world: Comic-Con International, which has drawn more than 130,000 attendees in recent years. Located in the desert of southern Arizona, Tucson is a good choice for conference planners looking to keep costs to a minimum. The city ranks among the most affordable major cities in the U.S., especially when it comes to lodging and food. 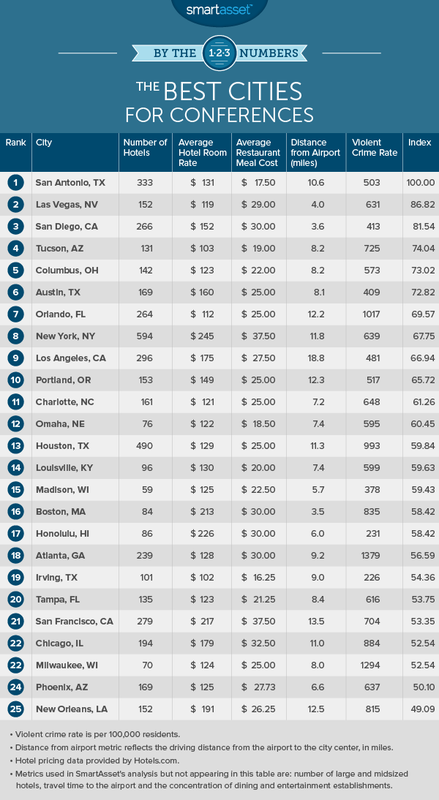 The average price of a hotel room in Tucson is just $103 per night, sixth lowest of any major U.S. city. Likewise, the average price of a meal at a moderately expensive restaurant in Tucson is $19. The largest city in Ohio, Columbus is home to both the state capital and the state’s flagship university, Ohio State. That makes it an obvious choice for academic conferences or conferences relating to government and public policy. Plus, the city is more than capable of handling crowds. Ohio State’s home football games routinely draw more than 100,000 fans, many of them from outside of the city. For conference-goers, the conference often serves as an excuse to spend some time in a great city. This may be the case for many of the attendees of Austin’s numerous conferences. The Texas capital has great food, warm weather and top-notch live music on any night of the week. At the same time, it has more than enough hotel space to host large conferences such as SXSW, which had nearly 85,000 registered attendees in 2015. If you’d rather not stay in a hotel room, many conference-goers in Austin choose to stay in an Airbnb rental. The top east coast city for conferences, Orlando has the hotels and amenities to handle tens of thousands of conference attendees in a single weekend with ease. That includes at least 44 large hotels, second most of any major city behind only New York. When it comes to sheer size, there’s no beating New York. Manhattan alone has 594 hotels. The area also has three airports, though none are exactly close to midtown. LaGuardia, the closest, is about 12 miles away. Those who would rather travel to the city by rail than bus or taxi will want to fly into JFK or Newark, from which Manhattan can be reached by the subway and New Jersey Transit, respectively. While the City of Angels is not the most convenient conference destination (the airport is nearly 20 miles from the city center) the amenities and attractions in LA are hard to beat. It has the highest concentration of entertainment and dining establishments of any major U.S. city and the fifth highest number of large hotels. The LA Convention Center offers 720,000 square feet of exhibit space and 147,000 square feet of meeting space. Known for its culture and natural beauty, Portland is a quieter and moderately less expensive alternative to LA for a conference on the West Coast. Approximately 6.9% of the city’s businesses are restaurants, bars or entertainment establishments such as bowling alleys. That’s the eighth highest concentration of any major U.S. cities. Conference attendees in need of something to read on their flight home should make sure to stop by Powell’s, the country’s largest used book store. And remember: all purchases made in the state of Oregon are sales-tax free. Hotel cost (one metric). The average price of a single hotel room. Data from the Hotels.com® Hotel Price Index™ (HPI™). Hotel availability (three metrics). The number of medium-sized hotels (20-250 employees), large hotels (250 employees or more) and the total number of hotels. Data from the U.S. Census Bureau’s Zip Code Business Patterns database. Restaurant cost (one metric). The average cost of a three-course meal at an average restaurant. Data from numbeo.com. Violent crime rate (one metric). The number of annual violent crimes per 100,000 residents. Data from the FBI Uniform Crime Reporting database and local government websites. Concentration of dining and entertainment establishments (one metric). Restaurants, bars and other entertainment establishments as a percentage of all businesses. Data from the U.S. Census Bureau’s Zip Code Business Patterns database. Airport distance (two metrics). The distance in both miles and travel time from the closest major airport to the city center. Data from CityLab and Google maps. SmartAsset ranked the 70 cities in our study on each of these nine metrics. We then averaged those rankings, giving half weight to the two measures of airport distance and full weight to all other metrics. Overall rankings were based on these averages, with scores ranging from 0 to 100. The city with the best average scored a perfect 100, while the city with the lowest average ranking scored a 0. Read the 2016 version of the best cities for conferences.